Bring high fashion to your favorite potted plants using the Gardman Black Heavy-Duty Plant Caddy Assortment. Using a caddy to elevate your plant helps air circulate fully around it, and this fantastic package provides two differently sized units, for a striking set. The matching caddies are each crafted from durable metal rods, with a matte black finish for elegance. The first caddy holds pots up to 9.5" in diameter at the base, while the second caddy is great for planters with a 13" diameter base. The lasting, black finish on each piece remains lovely for many seasons, and casters on the base of the caddies allow you to reposition your plants in moments. This package is not only great for use in the home or outdoors, it also makes a wonderful gift for a friend with a green thumb. 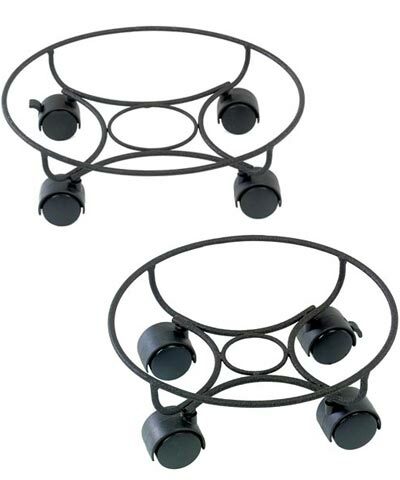 Perfectly elevate two potted plants using this Black Heavy-Duty Plant Caddy Assortment. Qty 1 Gardman Heavy-Duty Plant Caddy, Black, 10" dia. Qty 1 Gardman Heavy-Duty Plant Caddy, Black, 13" dia.